Posted in Donald Trump, Hillary Clinton, Television. 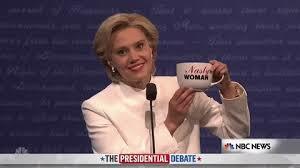 Tags: Alec Baldwin, Donald Trump, Hillary Clinton, Kate McKinnon, Saturday Night Live. RSS feed for comments on this post.. TrackBack URL. Well, I'm happy you are enjoying your comedy shows and I don't want to spoil your day, but how's that Obamacare going for you? I keep reading that the insurers are making for the exit and the prices are going up, up and away. Rates in the individual market have gone up, but for most people this is offset by subsidies. Plus the rates are not going up any more rapidly than in many of the years before Obamacare. Rates have not gone up much for business plans. Overall Obamacare continues to work very well. Many more people are insured, and we no longer have the problem of anyone being denied coverage due to health problems. All in all, not perfect due to Republican obstruction of attempts to improve it, but it remains a tremendous success. Well, whatever it is, it will probably all change when HillBilly takes over and asserts her old plan! I doubt she will go with her old plan. It wouldn’t make much sense when starting with Obama’s plan as opposed to starting from scratch. In the remote chance she wanted to I could not see it going anywhere in Congress. Hopefully she will be successful in getting the public option through, as an addition to Obamacare (and intitially in the plan) as she has said she wants, or a Medicare buy-in. It is with people over 40 or so where the costs get high, and I don’t think the insurance companies want them anyways. Let them have the more lucrative younger market, and let those over 40, or at least 50, have Medicare. Obama care is going good. I'm 62 and even if it goes up 25% I will still be paying a pretty low amount per month. I'm healthy not really used it but why should we be such a great country and you get sick once and your credit is ruined, you can loose your house etc. We need to think about the big picture nd I don't mind working still but I cant afford 600 a month payments and never been sick. If people abuse then they should get charged more. In Germany they have dental plans to. This country needs affordable medicine and Drs. I say cap the medicine. I buy something here for my lips the cost over seas is 5 dollars its 100 here. Who is making all that money? Cap the med corps and cap the lawyers this country would be better off the way it used to be. I agree with rep. on not letting the press know every thing about what we are doing with the war. Its like telling them our every move. Just plain stupid. when we have our young guys over there.